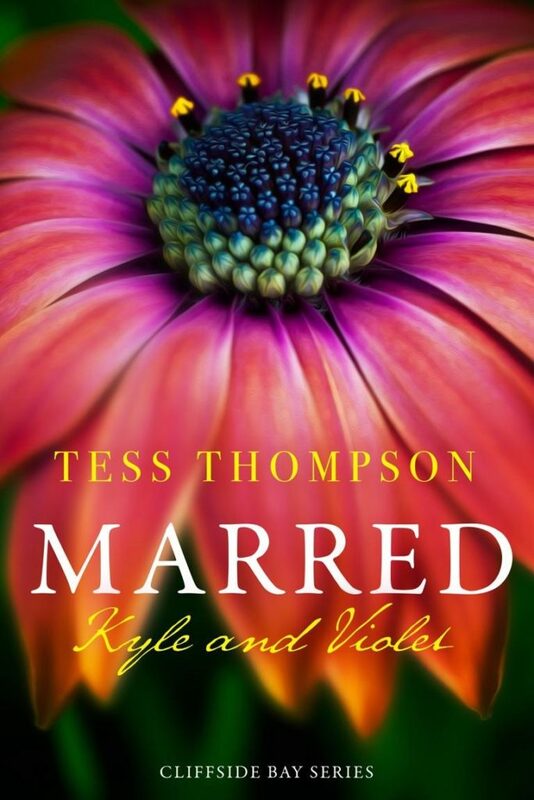 Then keep reading for an excerpt from Marred: Kyle & Violet by Tess Thompson! It will be here September 24th! HERE COMES THE SWOON — YOU’VE BEEN WARNED! 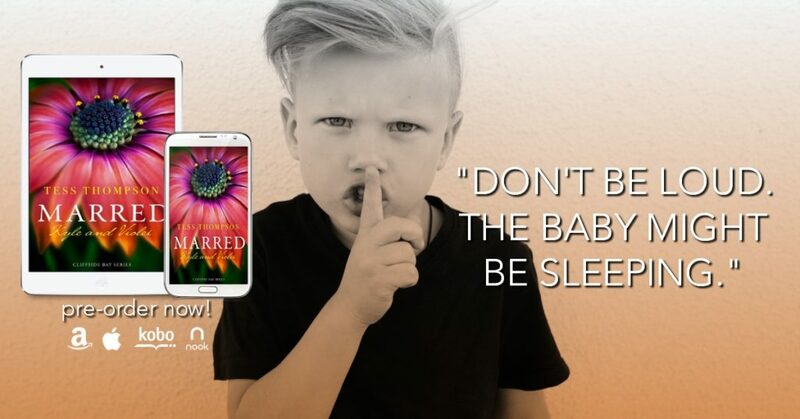 “Baby 101, that’s what,” Honor said as they followed her into the elevator. “We had one of the staff go out and get formula and diapers.” She put a keycard into a slot and punched the top floor button. Violet’s stomach lurched as they came to a stop. They all exited into a hallway. A plush, sage-green carpet felt wonderful under her feet, like walking on a firm mattress. She would love to take off her shoes and let it soothe her tired feet. The scent of lilies from a vase on a rectangular table tickled her nose. Where did he get lilies this time of year? Probably flown in from some third world country for exorbitant amounts of money. None of which trickled down to the poor farmers who grew them. “He’s not Superman,” Violet said under her breath. “I’ll try not to let it go to my head,” Violet said. “Eat a baby?” Dakota asked. Violet flushed with shame. Honor couldn’t have a baby of her own. Seeing a newborn must hurt. And here was cavalier Kyle Hicks with one just dropped into his lap like everything else in the man’s life. They reached the door of the suite. Honor didn’t bother to knock; she simply pressed the keycard against the door and entered, gesturing for Violet and Dakota to follow. Dakota mimicked her finger to her lips and made a shushing sound. When they entered the suite, Violet had to physically restrain herself from gasping out loud. The suite was magnificent. The same white marble floors as the lobby shone under the light of a chandelier made of sparkling glass. Posh, richly hued furniture in greens and purples, fluffy rugs, and glass tabletops with silver trim were arranged in geometric perfection. Paintings of various bright and vibrant flowers decorated the creamy sage walls. The bank of windows looked out on the entire town of Cliffside Bay, surrounding country roads, forests, and meadows. If it weren’t foggy today, or you would be able to see the endless waters of the Pacific. 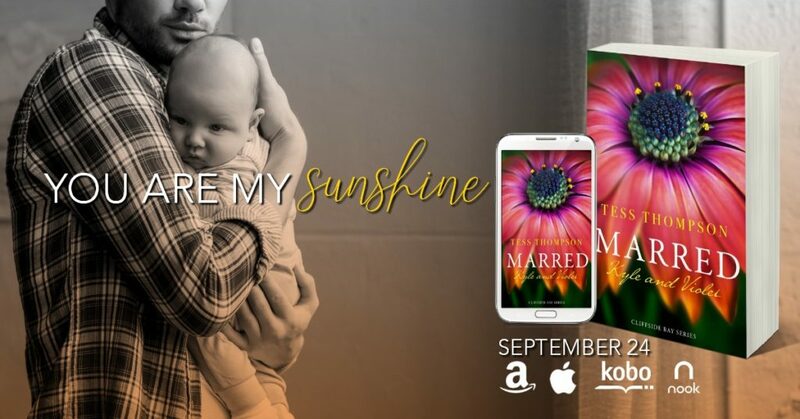 She quickly forgot all of that at the sight of Kyle Hicks with a baby in his arms. A spot of sunshine had broken through the gray sky and washed the room and the man in a warm glow. She drew closer, mesmerized. He cradled the baby against his chest and softly sang “You Are My Sunshine.” Kyle Hicks knew a lullaby. Go figure.